I always look up at least 3-4 recipes for the given item & then I “tweak” it and make it my own! I don’t think it is humanly possible for me to FOLLOW a recipe to the letter. Oh, how I can relate, Denise! So, I’m sure she won’t mind that I’m tweaking one of her recipes this month. Denise uses a lot of dairy products in her recipes. In fact, her blog reads a lot like mine would have read had I started blogging before I went dairy-free. You know, back when sour cream, cream cheese, yogurt, and cheese were all considered daily staples in my house. That’s not to say that every recipe she has has dairy. I found these amazing sounding black beans. They’re on my to-try list. And, had I wanted to make a dessert (seriously, when do I NOT want to make a dessert) I would have jumped on these flourless brownie cookies. Geez, Louise. 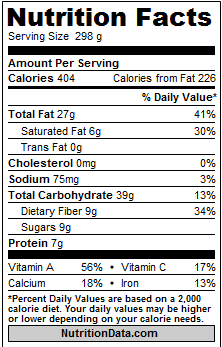 That’s a lot of calories and sodium for breakfast. You know how much I love my breakfast bowls, but that’s just out of hand. Time to try something new. So, I landed on her yummy breakfast recipe. Filled with brown rice, low sugar berries, and just a few nuts, it seemed the perfect way to incorporate a “safe” whole grain back into my diet – except for that dastardly yogurt. So, I left it out. Instead, I made a “yogurt-like” concoction by blending the berries with a big handful of spinach and a little bit of almond milk (or kombucha, if you have it, to mimic some of the happy, healthy probiotic beasties of yogurt). And, I skipped the raisins and maple syrup. I’m emphasizing low sugar foods these days. Tweaking. It’s what we do. Right, Denise? 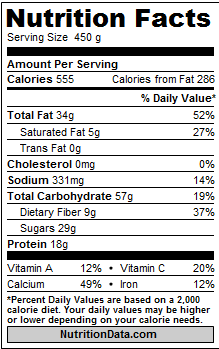 Here are the new and improved breakfast nutrition stats. You might notice that a large percentage of calories still come from fats. I don’t have a problem with that. I’m not afraid of good fats, like those found in nuts and coconut. I think that even leaves room for a breakfast cookie once in a while. Don’t you? But, if you can eat grains regularly, I urge you to give it a go! In a small blender (I use my fake Magic Bullet style blender) puree the berries, spinach and almond milk. Pour into a bowl. Top with rice, coconut and nuts. 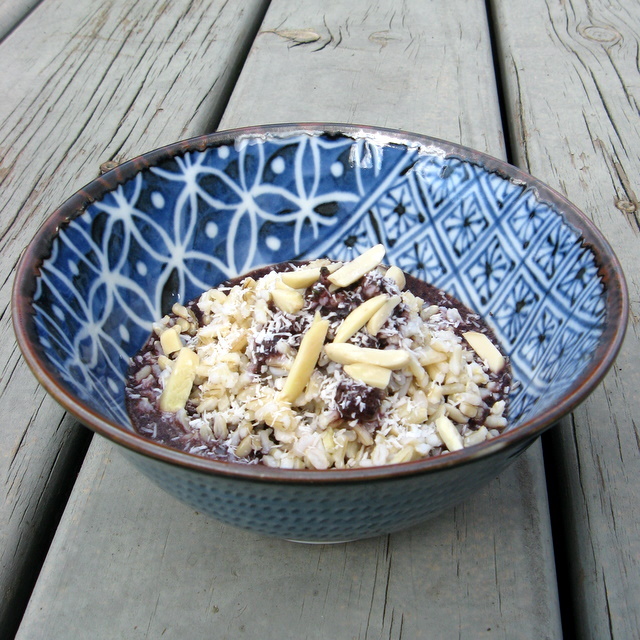 This entry was posted in Blogger Community, blueberries, breakfast, coconut, nuts, vegan and tagged secret recipe club;breakfast; vegan;recipe. Bookmark the permalink. This is the second breakfast recipe I have seen today using greens. Genius! Thanks. I LOVE getting a serving of greens in at breakfast. Frankly, I don’t love eating salads. So, I try to sneak my greens in other ways. I need more healthy breakfast recipes – great pick! Wonderful, healthy breakfast choice! I’m sorry that the rice bothered your digestion…ugh. So nice to be in Group C with you! I love coconut but never thought of adding rice and eating it for breakfast. What a wonderful healthy recipe you picked for SRC. What a nice exchange for breakfast! WOW – i would have never put all that together for breakfast yet it sounds divine! Glad to be part of SRC group C with you!! LOVE the way you write the lead-in to your culinary adventures. I wouldn’t of thought of spinach in a sweet breakfast dish…juicing it yes, with berries and brown rice…great out of the box thinking madame. Boo! that your stomach growled at the grain intruder. Could you perhaps subsitute the brown rice and use cauliflower or make it a bit porridgy with a cooked bean & almond flour mix instead? What a unique idea for breakfast. Sounds like a great way to start the day! I grew up eating leftover rice, we would heat it up and pour milk over it then sprinkle cinnamon and sugar on it. This is a much more sophisticated version so sad that your tummy didn’t like the grain. Hmm, spinach – I guess that it would go with it…however when I saw it I was surprised! Very interesting sounding recipe and oh so healthy too. Landed here through the blog hop. I’m too a tweaker of recipes and have a similar approach to what you do. In fact, even more I find I’ve moved away from recipes completely and just cook things based on what just sounds like it would go good together for me. I never would have thought to have rice for breakfast…this does look good though!